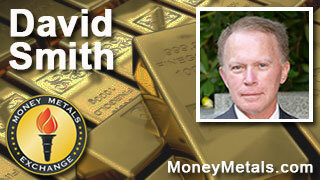 Coming up we’ll hear from David Smith of The Morgan Report and MoneyMetals.com columnist. David talks about the bullish market action in the metals so far this year, why the environment figures to be positive moving forward, and why those who haven’t secured the low-priced bullion they want yet could be running out of time. Don’t miss a fantastic interview with David Smith, coming up after this week’s market update. This week the white metals made some impressive gains. Silver prices broke to new highs for the year, while platinum challenged the $1,000 level and palladium saw a big advance on Thursday. Silver broke out above the $16 level on Tuesday, recording its highest close in more than 10 months. As of this Friday recording silver trades at $16.20 an ounce and is up 5.1% on the week. Platinum ran up to the $1,000 level mid-week and managed to finish slightly above it on Tuesday. However, the platinum market pulled back a few dollars on Thursday to negate the potential breakout. Platinum prices currently come in at $986 per ounce, good for a 1.8% weekly gain. Platinum’s sister metal palladium looks higher by 4.2% this week, with prices currently coming in at $567. Turning to the gold market, the yellow metal saw price weakness as it lost safe-haven appeal. The U.S. dollar and stock market are both gaining on the week as investors turn more optimistic on the economy. The Dow Jones Industrials powered ahead by 350 points to close at new highs for the year on Thursday. Copper and other industrial commodities joined in the party, but gold didn’t. For the week, gold prices are down 0.8% to trade at $1,230 per ounce. The upshot is that the gold to silver ratio is starting to improve in the favor of silver. When silver outperforms, that’s generally bullish for the entire precious metals complex. The gold to silver ratio hit a multi-year high of 83 in February. It has since fallen to 76 as of Thursday’s close. It could potentially fall a lot further – perhaps back toward the low 30s as was seen at the 2011 high for silver, or perhaps back all the way toward the classic ratio of 16 to 1, although that is a long way off at this point. Despite the recent strength in silver, oil, and other commodities, the official inflation gauges are barely budging. The latest Consumer Price Index report put out by the Labor Department on Thursday showed that the CPI rose a miniscule 0.1 percent in March. This, after the CPI fell 0.2 percent in February. With no immediate inflation threat, the Federal Reserve will almost certainly opt to keep its benchmark rate right where it’s at when Fed officials get together for their policy meeting later this month. The real question for investors is whether the Fed’s ongoing commitment to ultra-low rates will ultimately work to the benefit of stocks, bonds, and other financial assets. Or whether precious metals will be the prime beneficiaries as investors eye overvaluations in financial assets and their susceptibility to rising inflation down the road. A case can be made that precious metals are undervalued in general and that silver in particular is extremely undervalued. It’s important for investors who want to diversify into physical silver or other precious metals that they choose a reputable dealer who offers prompt and reliable service. Customers who buy based solely on slick advertisements or low quoted prices risk getting left holding the bag when a dealer fails to deliver. About 18 months ago, a so-called “low cost” dealer called The Tulving Company went bust. And earlier this month, Northwest Territorial Mint filed for bankruptcy court protection in the wake of a staggering damage award for libel and customer complaints of long delivery delays. David Morgan: Rule number 5: Do not get a raw deal from your dealer. Because of the specialized nature of the physical precious metals markets, selection of a well-established dealer with a quality reputation is essential. A good dealer will provide timely execution of your trades at fair prices, with reasonable fees. Note, going for the lowest price is not necessarily the best price. In the past, some dealers that squeezed their price margins too low in order to attract clients, were unable to make delivery, leaving those clients holding the bag. Obviously, there's those that shop price only, or, I guess you could say, learn the hard way. We have said it before – precious metals investors need to be careful about who they deal with. They should take a few minutes to investigate a dealer’s online reputation before ordering. They should expect the dealer to provide a firm estimate as to when the order will ship when that order is placed. If the dealer misses that estimate by weeks, it is time to find another source. Here at Money Metals Exchange, we have quoted shipping delays on certain products in extremely rare situations over the past 6 years. We can think of no legitimate reason for delays of 6 to 8 weeks or longer when it comes to the popular and widely traded bullion coins, rounds, and bars. Our customer reviews are overwhelmingly positive for a reason, including an A+ rating from the Better Business Bureau, being named the Bullion Dealer of the Year in the United States last year by a global ratings organization who compared Money Metals to 400 other American companies in the field, and having more than 60,000 satisfied customers. So regardless of whether you’re a new customer with a small budget or an experienced stacker, you can buy with confidence from Money Metals. Mike Gleason:It is my privilege now to be joined again by David Smith, senior analyst at The Morgan Report, and regular contributor to MoneyMetals.com. David, it's always great to have you on with us. How are you? David Smith: Well, it's good to be back, Mike. I'm pretty excited about talking about the metals today. Mike Gleason: Well, David, we've had some big moves in the metals so far this year. Gold stole the show during January and February, with silver lagging a bit, but now silver is finally playing a little catch-up and has surged over the last week, and recently made a 10-month high at over sixteen dollars an ounce. What do you make of the market actions so far this year, and what do you think is driving the advance in the metals? David Smith: I think it's very positive. It's fooled a lot of the people that are chartists. They look at these charts and they don't realize that, after five years of decline of a cyclical bear market, that when things turn around, sometimes the rules change a little bit. And these points that they look at that are supposedly providing resistance to upside prices have been cut through like a knife through butter. Now, of course, if you look at the metals today, we're seeing a retrenchment in gold and silver, which is to be expected, and we may see back and forth here for a little while, but I think the tone of the market is different than I've noticed in the last five or six years. The buying that comes in on the mining stocks is very powerful, with a lot of volume. And when the better stocks decline, they do so slowly. I think a person really needs to feel that we're, in all probability, looking at the resumption of the secular bull market in gold and silver, which began right after the 2001/2002 area. And I believe that this leg is going to take us to new all-time nominal and real highs before it's finished in a few years. Mike Gleason: Speaking of mining stocks, you of course follow the mining industry extremely closely and do a lot of analytical work, along with David Morgan and the rest of the team there at The Morgan Report. Now, as we're talking here on Thursday morning, we're looking at gold bullion up roughly 16% for the year. And based on this week's advance, silver has pulled ahead slightly, and now shows a gain of 17%. However, if you look at the GDX, the major gold mining index, it's up about 65% so far this year. The HUI has done even better and had a huge advance this past Monday. So why have the miners outperformed the bullion by such a wide margin? David Smith: Well, for one thing, they've been sold down on a proportionate basis much more severely. If you look at, say, the 2011 highs in gold and silver, gold has dropped, I think, about 42% from those prices, and silver is down around 70%, but the mining stocks, some of them are trading at sixty to eighty year lows on the TSXV. So they have been sold down into a hole, and I could just give you a couple examples without mentioning names, but one stock I follow was $11.50 in 2011, and it had one operating mine and it now has two that will operate above $20 silver. I bought that stock for $0.27 a couple months ago, an $11.50 stock. There are many, many others the same way, almost across the board. A lot of the producers have dropped by 90%. So they were in such a deep hole, that when they came out, it almost had to be vertical, and that's what we've seen so far with some of these, up three and four hundred percent from their lows of just two months ago. Mike Gleason: A lot of people talk about whether it's the bullion that leads the mining stocks, or the mining stocks that lead the bullion. What do you look for there in terms of confirming a breakout? What do you like to see? David Smith: People have different opinions on this, but I think it's very positive that the mining stocks are being bid up in a way on big volume and big money. Institutional money is coming into these areas, especially the indices that you've mentioned. The metals themselves have specific chart points that people look at, and they say, "Well, if it goes above that, it means such and such." I think for silver, we need to see prices move up above ... it's above $16 right now, but move up into the area of $18, $20 later this year. And those are very important pressure points. I think when that happens, when those levels are attained and maintained, then we'll have further confirmation that the lows are in, and that we're facing the possibility of a very long and lengthy bull market. Above $26, and that's an incredibly important point from the chartist standpoint. If we get silver, or when we get silver, above that point, that will really say something very important, because then you'll see a sustained rise beyond that if that level is attained. I'd say about $1,450 on the gold. So those are two rough areas to look at, but the point being, I think if a person waits, if they don't have any physical metal now, and they wait into those areas, they're going to pay a lot more, obviously. But then, there's the question of just how much is available. When this market was getting started, right up until 2011, there were questions about supply from time to time, especially in 2008, which was kind of an artificial situation. But I think now we have a systemic issue of being able to find enough metal for the demand when it comes and increases the way it has been. So sooner rather than later, if a person intends to either establish a physical position or add to it. Mike Gleason: Talk about your philosophy here with respect to mining stocks versus having the bullion itself, because you've actually written articles about this, including a great one last summer on MoneyMetals.com. Now, there certainly can be major investment upsides to owning the miners during bull markets, but you've noted that mining stocks and streaming companies should not be a substitute for owning the physical itself. Explain your thinking there. David Smith: That's really true. And I stand 100% behind what David Morgan has always said in his discussions in The Morgan Report, and that is get the physical first. Get what you need as an insurance policy, and perhaps an investment piece of it, before you start in the mining stocks, because they're a whole different creature. The mining stocks are a tool for trying to increase your wealth, but the gold and silver physical that you hold in your hand, that's an insurance piece that you would use if you needed to use it for barter, if you have a collapse of confidence in the paper promises that's in your wallet, if you have runaway inflation. There's so many uses for that physical metal. So you want to have that, have it in a safe place, keep it a secret, don't be telling people that you have it, your neighbors, this type of thing. Then, if you want to go to a higher level of risk, then you can start investing in the mining stocks after you've researched them. And they tend to outperform the metal, but they have not done so for most of this bull market, but I think that's going to change. They potentially have the leverage of two or three times what you might make in the physical metal itself. But they are not a substitute for the metal and, in my view, they should not precede holding that metal. For one thing, if you wait around and try to get some metal, you may not be able to find any. And I think we're going to see that day coming down the line where it's extremely difficult to get the product that you want, with the premiums going higher, taking longer to have it delivered, and in some cases, might not be able to get it at all. Mike Gleason: Furthering the point on supply here, copper is taking a major beating. Now, we're due to the economic slowdown. Of course, silver is mined as a byproduct of copper often, I've read something like 20% of global silver supply comes from copper mines. So talk about this because, as we all know, and you just alluded to it, the supply-demand situation for silver does not allow for a lot of margin. So if copper mining is going to slow down significantly, what effect might that have on silver? David Smith:Well, by definition, there'll be less silver produced since between 60% and 70% of silver is a byproduct of base metal supplies. You mentioned copper, also lead and zinc. And there's another issue too, there's actually a certain amount of silver that is, not what you would call a byproduct, but is created when you're separating gold as well, too. I think that's another 6% or 7%. So the overwhelming majority of silver comes from those sources, with about 25% coming from pure silver miners, where the majority of their silver comes from actually mining the silver veins, and they still get quite a bit of lead and zinc in there with that as well, too. To me, that is an indicator that you watch, but you don't try to make your trading decisions based on it. It's a lagging indicator. It's just something that adds fuel to the supply question fire if you see a sustained reduction in the production of copper and base metals. Mike Gleason: Platinum and palladium have also done well in 2016, although they're both lagging behind the money metals, gold and silver. Both of the PGMs are up in the neighborhood of 11% to 12% this year. But it does look like they're having a hard time sustaining upside momentum over the last month or so. So why are platinum and palladium lagging? Is it economic concerns pointing to less industrial demand? What is it? David Smith: I think a lot of that is the concern with the global slowdown in the economies, because platinum and palladium, they have a certain investment quotient and a certain jewelry quotient and a certain medicinal uses. But by and large, they are industrial metals. As you know, platinum and palladium, the biggest uses for those two metals are in catalytic converters for automobiles and trucks. So when we see sustained strength in the economies going forward, that will tend to turn things around. Then, also, there's the question of the supply coming in. For example, just a couple days ago in Zimbabwe, there was an internal memo that showed that the largest platinum producer there might have structured their payments of the money for their salaries so that they would avoid Zimbabwean taxes. If that is the case, the government could come down pretty heavily on them, maybe even nationalize the company. And they're one of the major producers of platinum. These things all come together in the mix. I think you'll see sustained higher platinum and palladium prices as we move more into an inflationary environment down the line. But I believe that they will lag gold and silver at this point, because gold and silver are functioning as money now. If I could make one point, Mike, here on gold and silver, I think it's extremely important for people to understand. I've noticed a lot of hand wringing the last couple weeks about, "Oh, gold has been strong and silver has not been as strong." Here's the thing, Adam Hamilton and others have shown, and David Morgan as well, too, that there's about a 90% correlation in the direction of gold and silver over time. So in other words, if gold is going up over time, silver will as well, too. But they do not move in lock step on a day to day basis. And what I remember from my trading, when I was trading futures in the 1970's up until the 1980 bull market top, I would see, and this is especially in the latter days, I would see gold just moving higher, day after day, and silver just absolutely sitting there. Then, all of a sudden, it was like a tag team. And all of a sudden, silver would just break out and start moving. It would go higher day after day, and gold would just be going sideways. People should not be concerned about this, if they're not moving in tandem on a day to day basis, because that's just not the way they operate. I've noticed the same thing here in this beginning of this new bull market phase. I think people should kind of keep that in mind. Now, if they're both moving down sustained, you don't want to see that. But at the same token, don't worry if just one is moving up in a given week and the other is pretty quiet. Mike Gleason: Yeah, prime example here, this year we saw, as I mentioned earlier, gold doing quite well in January and February, silver lagging a bit. Now, this past week, we get a big silver surge. Gold is just kind of going sideways. And lo and behold, they're now up about the same percentage for the year, 16%-17%, but on a week to week or day to day basis, they are trading quite differently and have over the first three and a half months of the year. One of those potential rocket fuel situations for higher metal prices, of course would be the central bank policy decisions. We've seen negative interest rates in Europe. They've maybe talked about that a little bit here in the States. Obviously, they've been reluctant to raise beyond the quarter of a point that we saw back in December, that's driven a lot of the metals advance. What are your thoughts there? Are we going to continue to see very accommodative interest rate policy, very inflationary monetary policy, coming out from these central banks? What are your thoughts on that area? David Smith: Well my read on this, Mike, is that the central banks, and also the big banks, in these different countries are running out of options. They continue to do things that haven't been working very well. And they don't have an option of doing things that will work well because they don't have that mindset, at least yet. The old story of what Winston Churchill said about Americans, they always do the right thing after they've done everything else first. And I think that's what the central banks are in the process of doing. They're trying to go down, and they now have in some cases, negative interest rates where you pay the bank to store your money, or you pay the bank to buy a bond. That's insane. If you have negative interest rates, the signals that interest rates give off, as to the viability of a project or an investment, are no longer there. The customer cannot make an intelligent decision. So I think we're going to see them continue to push things down. And what they're trying to do is to stimulate the people to buy and to make purchases and get the velocity of money up. People aren't doing that. You look at Japan, where they pushed things down to an incredible extent, what they've done, the only thing they've stimulated in Japan is for people to buy record numbers of safes so they can store their money at home. They have a huge demand for 100,000 yen notes, which is about $1,000 in our money. But they're not going out and buying things. Until the velocity comes up, they're going to have a deflationary situation, which is the greatest fear of central banks, rather than an inflation. Believe it or not, they want inflation, which by definition takes away the purchasing power that you and I have year after year. Mike Gleason: We got news today that Deutsche Bank settled a class action lawsuit from investors regarding rigging the silver fix price. Turns out the bank was cheating its own customers by colluding with the other participants fixing to manipulate the price. And it sounds like Deutsche Bank is promising to hand over the goods, emails, and electronic chats and so forth from the other banks who participated. Now lots of metals investors have almost given up on the idea that any of these criminal bankers would ever really be held to account. The CFTC spent five years investigating these issues, and ultimately failed to prosecute anyone. To us, the story is just further confirmation that price discovery in precious metals is a flawed, broken, and corrupt process. What is your take on this story and the issue of price discovery generally? Any chance metals producers and investors can escape this flawed system anytime soon? David Smith: I think Mr. Market is exerting his muscle in this area. And this doesn't surprise me at all, what Deutsche Bank has admitted to. This is just soup of the day. You can go back and you can look at all these other banks have done the same type of a thing Goldman Sachs, just a couple days ago, agreed to pay something like five billion dollars for misleading customers about the viability of certain mortgage vehicles. The banks have admitted, in the UK, that they rigged the LIBOR rate, which is the inter-bank rate that banks charge each other. I mean, if there's something that they can rig, they'll do it. All markets are rigged. I think Chris Powell (of the Gold Anti-Trust Action Committee) said, “There are no markets, just manipulation.” It's really true. You don't have to be a cynic to think that they're doing the same thing in gold and silver. They're just after the unlimited amount of money that they can fleece the public for. So far they've gotten away with it, but these events like you just mentioned, and the power of the internet to breath light into the dark recesses that these bankers and investment banks operate in, are showing that, more and more, it's getting difficult to hide your misdeeds. And I think that ultimately will bring down the house of cards. When people realize just what's going on, and they say, "You know what, we have to have this thing cleaned up, and not just pass some more laws that insulate the biggest players, and take money from the public in order to take care of their misdeeds." There's going to be an insurrection on the part of the consumer and the investment people and at some point gold and silver will be the vehicles that allow that to happen, because they're real money. Paper money is never able to stand up against the truth and the light that real money bring to the investment areas. David Morgan points out, and he's done a lot of research on this, there has not been a single paper unit that has survived the test of time. They have always gone to their intrinsic value of zero. And people go, "Oh, but with the U.S. dollar in my pocket, I can go down and I can buy a car today." You know what, I bought a Firebird in 1979 for $4,250. That same car today, not produced even nearly as well, would probably cost me $40,000. So tell me about how much my money has lost in that time. The U.S. dollar is worth two cents of purchasing power compared to what it was in 1913 when the Federal Reserve was put together. And go back and compare that with the purchasing power of gold and silver. And I think the people that have some will be pleasantly surprised. Mike Gleason: Yeah, excellent point. That's really the crux of owning precious metals, owning gold and silver, it's preserving that purchasing power, a way to have some insurance against your paper money. Those examples are fantastic in terms of what an ounce of silver or an ounce of gold would buy today versus 100 years ago. Then, compare that to how little your paper money buys today versus that same time period. Well as we begin to close, what do you envision for the metals, the balance of the year here, David? We did see strong starts to both 2014 and 2015, only to see the metals fizzle off as we went throughout the year and they ended lower. So what do you see ahead in the last few quarters of 2016 for gold and silver? David Smith: I think we're going to see big swings in the precious metals and the mining stock prices throughout this year. What I want to see is the classic definition of a bull market, which is higher highs and higher lows. So on any reactions that we get, one of which we're looking at now as you and I are talking, I want to see some of those lows holding, and then I want to see new buying coming in on volume. So you have low volume on the way down and higher volume on the way up. And then, over time, stair stepping up, even as people worry that these signals are not going to hold and get us through the year. I think it's very possible that we'll see solve in the mid $20s by the end of the year, and gold perhaps as high as $1,400 or so. It's really difficult to predict price and time, and very few people do it, wisely that they don't do it, but I think this is going to be the base-building, strength-building year where people start getting back the money they've given up before, if they held the mining stocks over the last five years. And I think it's an opportunity, I think it'll be the last really good opportunity to add to your precious metals holdings on a physical basis. If you don't have them, or if you don't have enough, at prices that are reasonable in relationship to the premiums and the demand. And I think 2017 is going to really show us that the supply situation has become quite tenuous, and if any new demand comes into the market on the part of the individual investor or the institutional investor, which I think they'll do it in both cases, I think you're going to find a real difficult time getting the metal that you want for a fair price. So going forward, I'm very optimistic about the market. I think the bear market is over, the cyclical one. I think the secular (bull market) is reasserting itself, and we're going to have several, three, four, five, six, very good years ahead for people that hold precious metals and mining stocks. Mike Gleason: Yeah, we've got, obviously, a lot of constructive things happening here with the prices. As we talked about offline, a lot of black swans seem to be circling around in these markets. And if any one of those seems to happen, then, obviously, we could have a huge spike in demand, supply issues could rear their head again, and we'll see what happens from there. It figures to be kind of a bullish setup. Well thanks very much for your time and your excellent insights as usual, David. As always I'm looking forward to your next article for MoneyMetals.com, which I believe is coming out very soon. That's always great stuff. And we certainly look forward to talking with you again real soon. Hope you enjoy your weekend, David, and thanks for joining us. David Smith: Very good, Mike. I always enjoy speaking with you and your audience. Mike Gleason: Well that will do it for this week. To check out David's insightful columns, just go to the news section on MoneyMetals.com, or type in David Smith in the search box and you'll get links to all of his work. Be sure to check that out. Thanks again to David Smith, senior analyst at The Morgan Report, and MoneyMetals.com columnist.